We have over 20 years experience in providing professional and affordable cleaning services around Caterham and the surrounding areas. We offer our services to residential and commercial properties including offices, hotels and shops. For professional fabric cleaning on carpets, rugs, upholstery and in-situ cleaning including tough stain removal, contact our friendly team for a free no obligations quote for an unbeatable service. Hi, I’m Jonathan and for over 25 years I’ve been supplying carpet, curtain and many other cleaning services to homes and businesses in and around Caterham. My beliefs have always been that the best way to success with a local business is to offer an exceptional service which is both professional and personal, giving great customer service and achieving excellent results. Give me a call today and I’ll explain what we can do for you and I’ll give you honest and realistic advice. At the same time you can get an instant no-obligation quote. 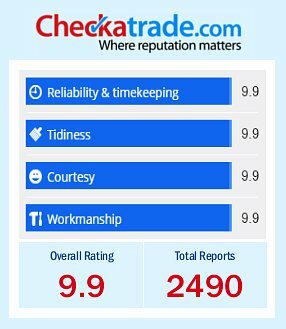 We are very proud members of the Check-a-trade scheme as it enables you to see certified and genuine reviews from past customers in and around Caterham. Give us a call us now on 0800 587 4571 to find out more about the cleaning services we provide to homes across Caterham and how we can help you. Apple Clean are your local fabric cleaning experts with years of experience providing high quality cleaning services across the South East including the area of Catherham and further afield. With a team of professional cleaners who have extensive experience in the local area, Apple Clean provides excellent services to both home environments and working environments. We take pride in our outstanding reputation and endeavour to provide a first class, friendly and qualified cleaning service. 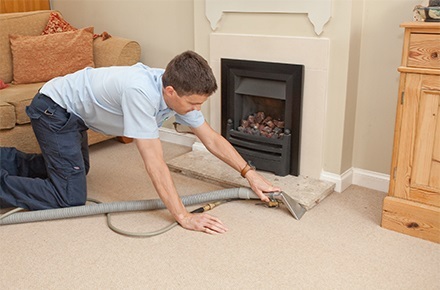 Although many forms of dust can appear harmless, if left for an extended period of time, dust can build up and can be dangerous to your health, particularly if you suffer from allergies or are asthmatic. 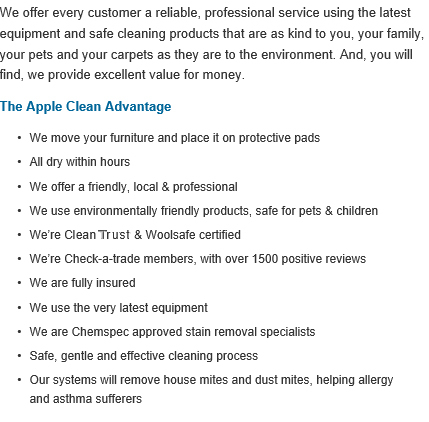 Apple Clean provides an excellent cleaning service using the latest cleaning techniques to ensure that any dust and mould is thoroughly removed from all fabrics, leaving you with a clean, fresh home that will stay clean for longer. Apple Clean provides high quality cleaning services for a range of different fabrics, curtains, upholstery, carpets and more and our stunning reviews on Checkatrade give you confidence in our practical and professional level of service. Plus with over 25 years of experience the experts at Apple Clean have experience removing darker and more permanent stains which allows us to restore any old fabrics or carpets which may have lost their lustre. Our state of the art industrial equipment gives us the capability to provide extremely efficient stain removal as well as providing in-situ curtain cleaning services to all clients. 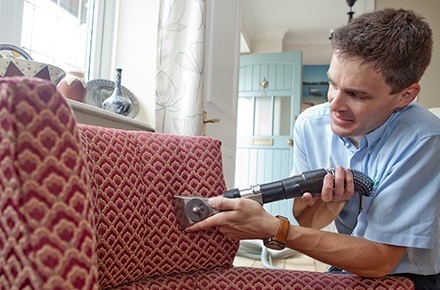 We ensure that all fabrics are well looked after throughout the cleaning process and with extensive experience of the local area our team of trained professionals provide expert cleaning services to both your home and working environments, no matter how small or how large the project. Spruce up your home or working environment with a professional clean from the experts at Apple Clean. For more information on the range of cleaning services we offer to clients in Caterham and the surrounding areas including Kingston and Chertsey, or to obtain a free no obligations quote, please do not hesitate to get in contact with Apple Clean today. Simply fill out the form to the right with your details and your query and we will get back to you as soon as possible. You can also call Jonathan on 0800 587 4571 to discuss your specific cleaning requirements and to obtain a quotation. We hope to hear from you soon.